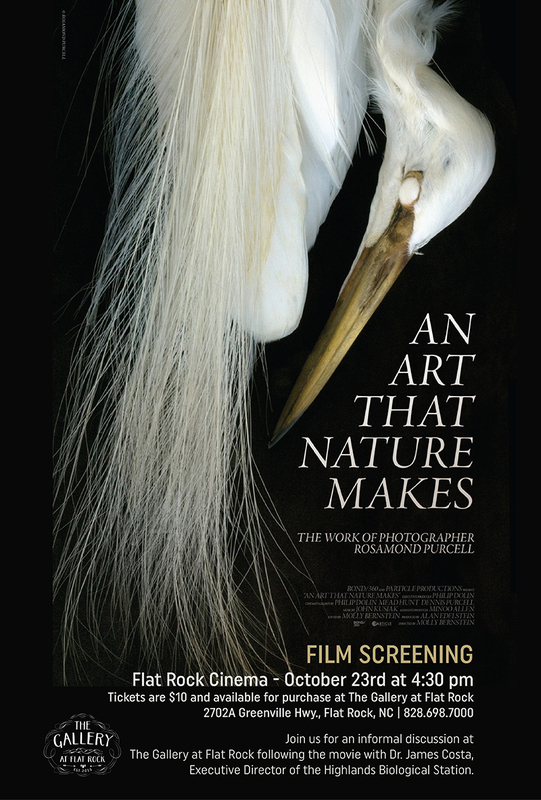 The Gallery at Flat Rock is excited to present the screening of the film “An Art That Nature Makes” on Oct. 30 at Flat Rock Cinema. This documentary film, directed by Molly Bernstein, details the processes behind celebrated photographer Rosamond Purcell’s work, which highlights the unexpected beauty in the discarded and decayed. The screening is concurrent with an exhibition of Purcell’s photographs, which will be on display in the gallery from Oct. 18-31. The film begins and ends with scenes of her 20-year relationship with Owls Head, an unruly 13-acre junkyard in Maine, and her friendship with its proprietor, William Buckminster. In the retrieval of carefully selected objects from the junkyard — and in the photographing of those objects back in her studio — we see the essence of her obsessions and her engagement with collecting and classification. In-between we are treated to the highlights of an extraordinary career comprising portraiture, large-format Polaroid’s, collage, a re-creation of the wonder cabinet of the 17th-century Danish natural philosopher Ole Worm, and stunning collaborations with biologist/writer Stephen Jay Gould and magician Ricky Jay. In An Art That Nature Makes, the timeless themes of disintegration and metamorphosis find new and unexpected expression. out of print copies of “Owls Head,” “Illuminations: A Bestiary,” “Bookworm," and “Dice: Deception, Fate & Rotten Luck." Tickets to see the film are $10 and are available for purchase in advance at the gallery or online. To learn more, please call the gallery at 828-698-7000.